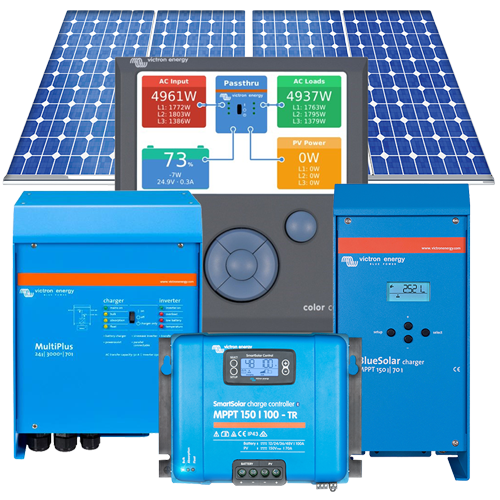 Specialized Solar Systems popular mid-range 5kVA 9-12kWh off-grid solar system. Generating a daily average of 12kWhrs with a battery storage that supports 18kWhrs of daily electrical energy usage. Our popular mid-level off-grid residential solar system designed by Specialized Solar Systems. Using superior quality solar components, this off-grid solar system will supply our customers with a daily average of 12kWhs of solar-generated energy electricity. It includes a battery storage capacity that supports 18kW hours of daily electrical energy usage directly from the battery before reaching a 27% Depth of discharge (DOD), therefore maximizing the batteries lifespan. This solar system includes a solar module (PV solar panels) array which will generate an average solar yield input of 12kWh/day using a 2250Watt solar module array calculated in George, South Africa. Our solar modules have a 10-year manufacturer’s product guarantee and a terrestrial 25 year an average of 80% solar yield.